Earlier the strategy involved in the business was different. With the introduction of the technology, the tensions have started growing into the existing business strategies. Remember your users love to access the service right from the palm of their hand and that is only made possible with the mobile application platform. Agreed??? We simply cannot blame themobile app technology, the reason why it happens is because the number of resources available to the users, has led to creating this chaos, but trust me this chaos has consequently resulted in some of the most efficient pieces of technology which we all enjoy utilizing it. Ok so this was all about why a user switches to another alternative, but what can be done best to re-engage your inactive app users to the mobile app. Here you go, continue reading…. Push-Notification can be utilized in order to engage your users. The reason behind sending push notification is that anything that flashes on our mobile screen catches our attention. This can be used to send notifications to your user relating to offers, discounts or even if the user hasn’t opened the app in a while. On the other hand, push notifications should be used wisely and strategically in order to avoid it from being annoying. This will help in building a strong relationship with customers which will be successful in driving up app usage. Today, the social media marketing has become a necessity for the businesses. Why?? Because your target audience is on Social Media, so it’s likely you already have business accounts on Facebook, Twitter and LinkedIn. You can even add other social media platforms, say suppose- Instagram, Snapchat, Pinterest and even YouTube. These platforms can easily help you in leaving a visual impact on the audience, making them an ideal place to promote your app. 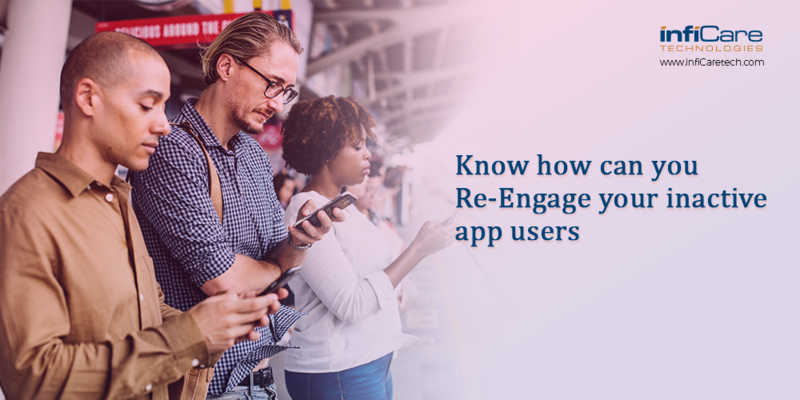 With these two tips, you can keep your users engaged or re-engage them. But one another fact you need to make a pace with and that suggests that your app must be developed by a best mobile application development company like infiCare, as only a professional app development company knows well, how an which app strategies can help your app go successfully. For more get in touch!